← Seasonal Depression and Weight Loss. Oh, and Happy Birthday, Dad! There is something so comforting about returning home. Even when ‘home’ isn’t exactly where you grew up. My parents don’t still live in the town where I grew up, but they do still live in the same state and in a beach town, just like my home town, so it all still feels kind of nostalgic. Throw in a drive to the store by myself in my parents’ car blasting the radio and I am right back to my angsty 16-year-old self. It’s wonderful. There was a palpable excitement in the air as we left for Cape Cod Friday night. 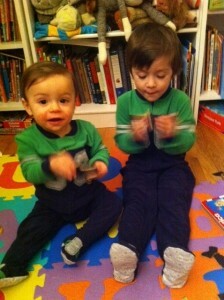 The boys even wore matching pajamas for the occasion! We arrived on Cape Cod late Friday night. When we awoke on Saturday, I did what I am sure most visitors to Cape Cod do first thing: I headed straight for Ocean State Job Lot. I did show restraint. I put back the Artichoke Bruschetta when I remembered that we already have some at home in our pantry (from my last visit) and even asked my husband’s opinion on purchasing matching classic sweatpants. I sent him a text message photo, certain that would cinch the deal. 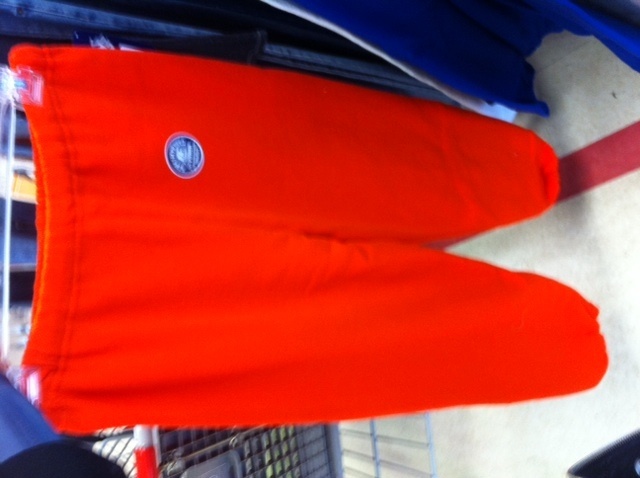 As if the term ‘matching classic sweatpants’ wouldn’t already do the trick. Personally, I was already envisioning us on Valentine’s Day. Able to consume as much homemade fondue as we want, what with our elastic waistbands and all. And then no need to change in between dinner and our Netflix movie! Helllllllloooooo, Perfect Valentine’s Day! No sweatpants. Boo to you, Boo. The rest of Saturday was spent decorating my parents’ new house for my dad’s big 60th birthday beach party-themed bash. I think that with the Underwater Hallway, Patio, Shipwreck Lounge and Parrot Bar, there was no mistaking the theme. 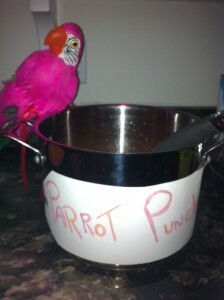 Just in case, though, I made everyone choose a ‘beach character’ and then wrote it on their cup for them before filling it with Parrot Punch. 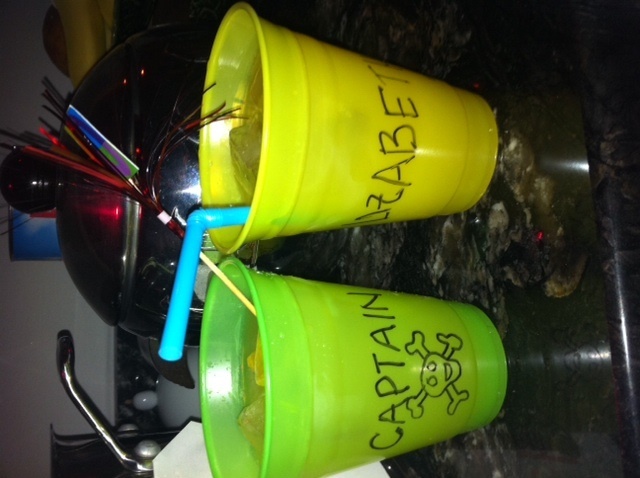 My husband and I were Captain Jack Sparrow and Elizabeth Swann. Ayyyyy, salty pirates, we were. Although my favorite choice was Pamela Anderson. We couldn’t remember her Baywatch character’s name, and there were only about 16 iphones in the house, obviously leaving us no way to find it out. So, I just wrote ‘Pamela’ and made a beautiful drawing on her cup that I think, in a very classy way, clarified who ‘Pamela’ was. Would you believe I lost the photographic evidence of this drawing? Shame. 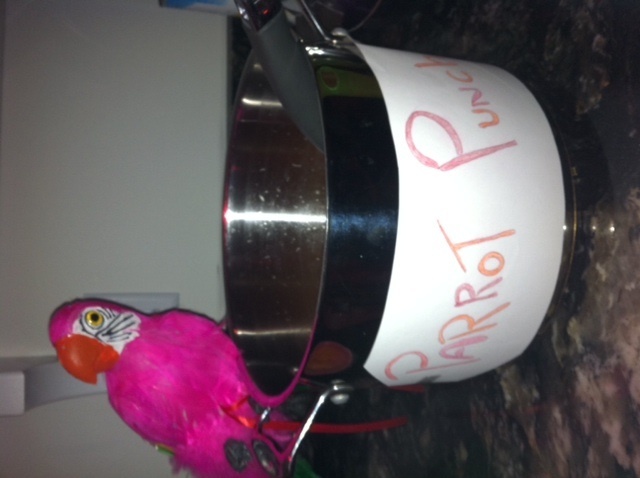 Speaking of the Parrot Punch, I don’t think I put enough rum in because getting people to dance was well, ultimately, impossible. I completely failed. Yes, yes, I even put on my New Years Eve mix. Yes, that mix obviously includes songs like Calabria 2008* and Gonna Make You Sweat (Everybody Dance Now), that I (previously) thought were created solely because they render human beings incapable of not shaking their booty. I even tried acting out every single lyric to Grenade. To no avail. I got a few laughs. One uncomfortable stare. And no dance partners. Fortunately, between the amazing decorations, wonderful guests and delicious ice cream cake, the party was still a huge hit. Annnnnnnd I got my dance party the next morning when it was just my husband, kids and parents. 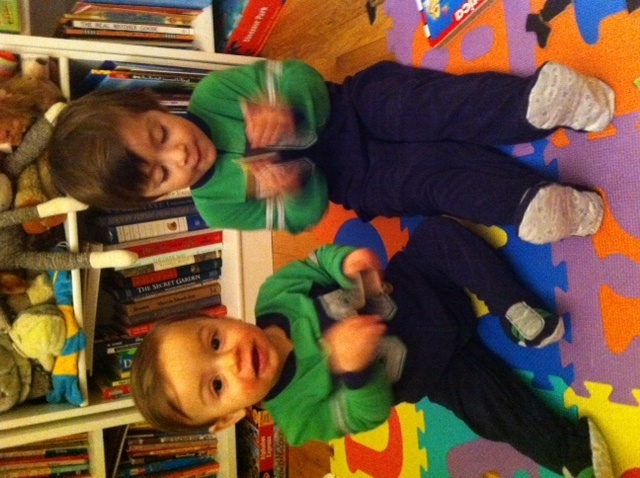 I should have known, since Sunday mornings are usually when we have some of our best dance parties when we are at home. I guess the moment just has to be right. And in our family, the moment for booty shaking is around 8:30 am on a beautiful Sunday morning. The rest of the weekend was filled with giant, heart-attack inducing restaurant breakfasts, lounging around, cooking, watching movies, the Superbowl food and commercials game, and even a trip to the beach. 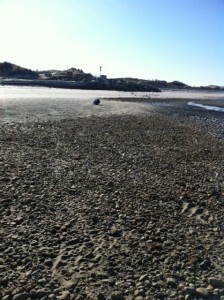 The beach in the winter is a fantastic thing. Beautiful, empty, salty and peaceful. I love it. 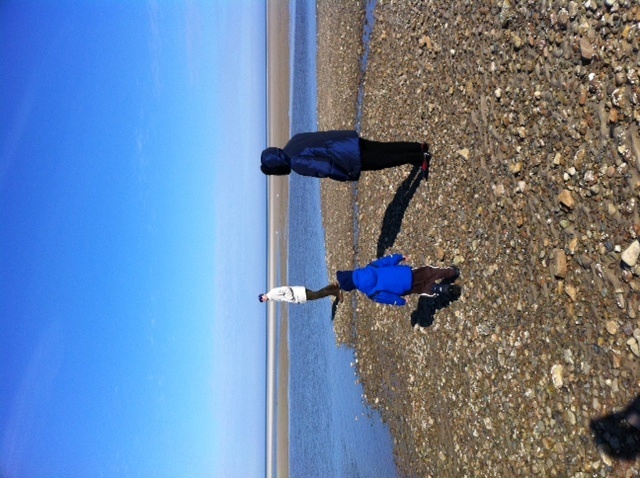 We walked down to a tide pool so that Carlitos could get salt water marks on his snow boots and find The Perfect Rock. 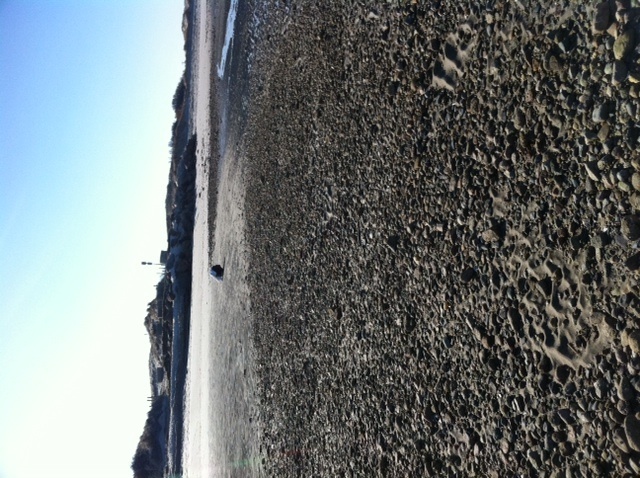 I was determined to find a sand dollar, but failed. I am starting to see a pattern. Perhaps I was meant to learn something about failure this weekend? Oh, wait. Where is Xavi during this big adventure, you ask? He is safely sleeping in his carseat. Waaaaaay ooooooooovvvver theeeeerrrrre. Okay, put down the phone. No need to report us. He isn’t actually that far. It’s really the angle, I swear. Plus, what, is a seagull going to come pick up the carseat and take him away? I think not. So there you have it. Our long weekend away in a nutshell. Plus, you have some songs to add to your Sunday morning play list. Because nothing says Sunday morning like a dance party. Nothing. *Warning: This video has copious amounts of booty in it. As well as women dressed as you might see them at a beach. Perhaps not the best YouTube video to watch from your cubicle. This entry was posted in Real: my personal trials, tribulations and tales and tagged booty shaking, pirate's booty, pirates, questionable parenting, salty, the beach, turning 60. Bookmark the permalink. Follow any comments here with the RSS feed for this post. Post a comment or leave a trackback: Trackback URL. As soon as I read “I don’t put the boys in matching outfits during daylight hours” I laughed to myself and said haha yes she absolutely does. As I scrolled down the page I realized you admitted it. I remember you and your husband having a slight disagreement about the matching outfits when I was home last time. Anyways, Im sad I wasn’t invited to your dads birthday party put sounds like a great time! Oh, Emily, I can’t believed you doubted me! I may (*may*) have many flaws, but being honest to a fault (ugh, another flaw?!?) is not one of them. I will always tell the truth. Please don’t be sad that you weren’t invited! Almost nobody was invited! I swear. It was a small, local party. 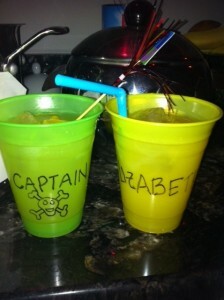 My mum just does up the decorations no matter how big or small the guest list. Promise. And I totally thought of you while dancing to Grenade. I know you wouldn’t have left me alone on the dance floor! 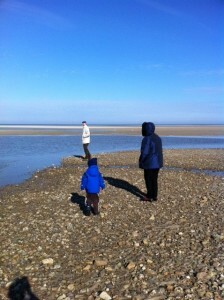 Cape Cod in the winter?! That sounds awesome! I’ve always wanted to go the ocean in the off season. 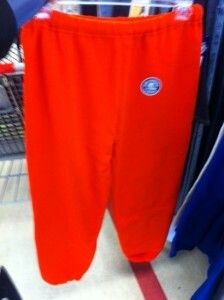 And BTW, I thought those sweatpants were a brilliant gift idea!